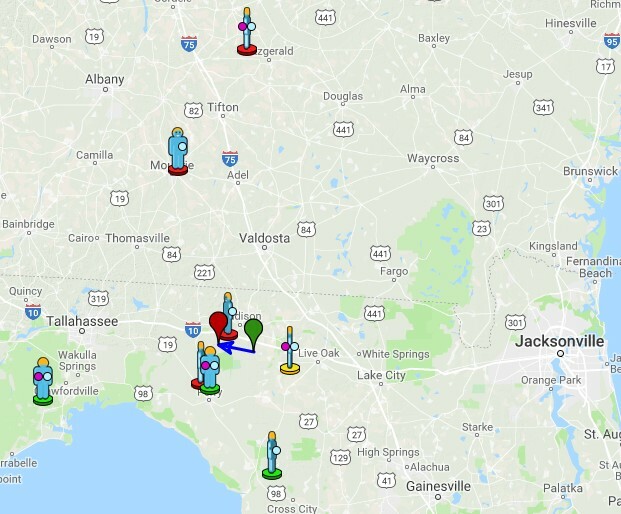 A great fireball was seen over Florida at about 22:54 on March 30 (3/31/2019 03:54 UT). Several videos have already been shared and more than 200 reports have already been sent to the AMS (American Meteor Society). The GOES-16 satellite was detected a small flash associated with the passing of the meteor through the atmosphere. See a compilation of some of the videos already confirmed. In addition to the videos that were sent on the AMS, there were also 8 reports of people that was listened a Sonic Boom. 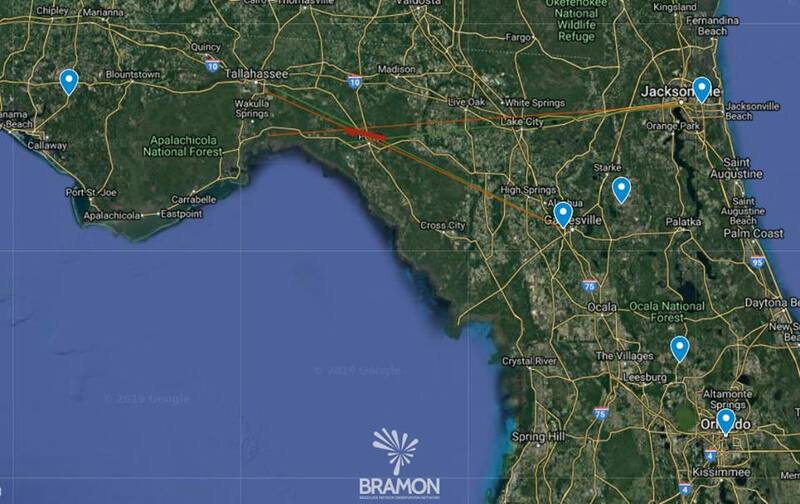 After analysing videos of Florida fireball, we make have a preliminary map. 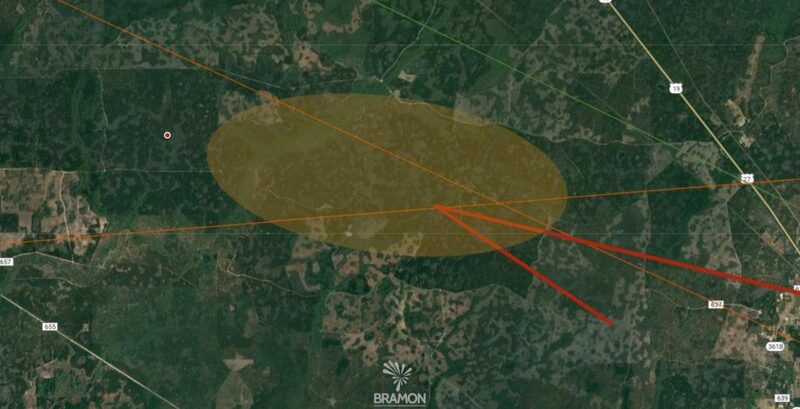 The trajectory was traced from the triangulation of two videos obtained in Jacksonville and Gainesville and the result of the triangulation corresponds with the image of the flash recorded by the GOES-16 satellite at same time of the meteor. This confirms that the flash detected on the satellite was associated with the event. 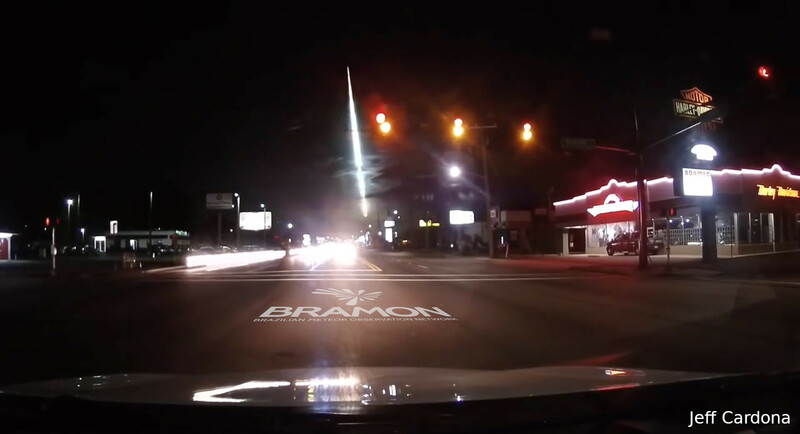 The meteor traversed the atmosphere with an average velocity of 14.94 km / s at an angle of 67 deg could be visible up to the altitude of 15.45 km, which is considerably low for a meteor and a strong clue that it left meteors on ground in the northwest of the city of Perry in Taylor County. By the perceived brightness in the images and especially the final altitude of the fireball, the chances of having meteorites in the ground are high. From the calculated trajectory and the analysis of the winds in the region, we estimated that fragments could be found in the area highlighted on the map. We do not calculate the initial mass of the object or the mass resulting from its passage through the atmosphere due to the lack of more precise data about the object. But in the estimation of the dispersion area we consider fragments of 1 g up to 10 kg. BRAMON continues to seek new data and information to better understand the event. As soon as there is news of this case, it will be disclosed here.